10 G None No Power Seat 10 G is an Economy Class Bulkhead seat that has extra legroom. However, this seat is a bassinet location and passengers traveling with infants may be seated in this area. The tray table is in the armrest, making the armrest immovable and slightly reducing seat width. There is no floor storage for this seat during takeoff and landing. 12 A None No Power Seat 12 A is a standard Economy Class seat that is missing a window. All A seats may have limited legroom and storage space underneath the seat due to the presence of an entertainment equipment box under the seat in front. 12 K None No Power Seat 12 K is a standard Economy Class seat that is missing a window. All K seats may have limited legroom and storage space underneath the seat due to the presence of an entertainment equipment box under the seat in front. 16 C None No Power Seat 16 C is a standard Economy Class seat. However, this seat juts into aisle and may often be bumped by service carts or others passing by due to the awkward configuration transition from 3 to 2 seats. The proximity to the lavatory may be bothersome. 16 H None No Power Seat 16 H is a standard Economy Class seat. However, this seat juts into aisle and may often be bumped by service carts or others passing by due to the awkward configuration transition from 3 to 2 seats. The proximity to the lavatory may be bothersome. 17 A None No Power Seat 17 A is an Economy Class seat that may have limited recline. The proximity to the lavatory may be bothersome. All A seats may have limited legroom and storage space underneath the seat due to the presence of an entertainment equipment box under the seat in front. 17 B None No Power Seat 17 B is an Economy Class seat that may have limited recline. The proximity to the lavatory may be bothersome. 17 D None No Power Seat 17 D is an Economy Class seat that may have limited recline. The proximity to the lavatory may be bothersome. 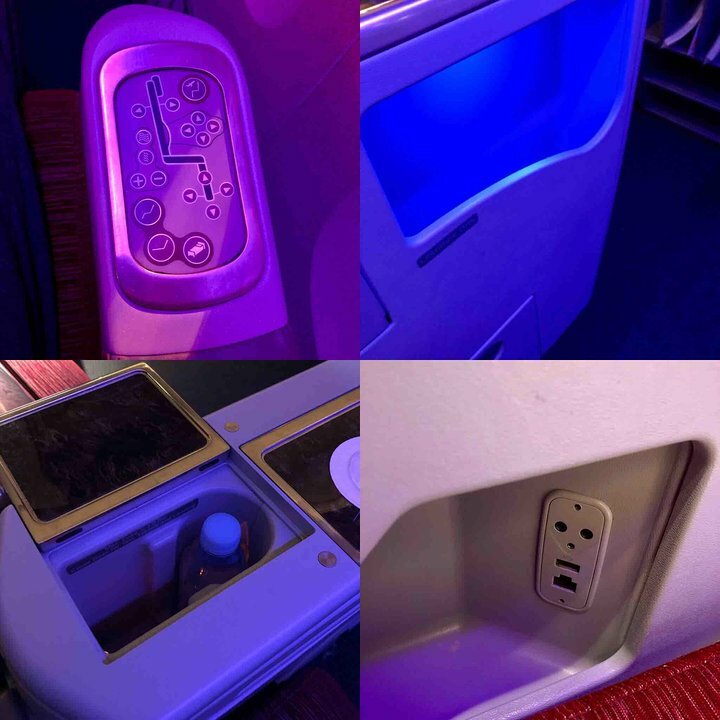 All D seats may have limited legroom and storage space underneath the seat due to the presence of an entertainment equipment box under the seat in front. 17 E None No Power Seat 17 E is an Economy Class seat that may have limited recline. The proximity to the lavatory may be bothersome. 17 F None No Power Seat 17 F is an Economy Class seat that may have limited recline. The proximity to the lavatory may be bothersome. 17 J None No Power Seat 17 J is an Economy Class seat that may have limited recline. The proximity to the lavatory may be bothersome. 17 K None No Power Seat 17 K is an Economy Class seat that may have limited recline. The proximity to the lavatory may be bothersome. All K seats may have limited legroom and storage space underneath the seat due to the presence of an entertainment equipment box under the seat in front. 18 G None No Power Seat 18 G is an Economy Class Bulkhead seat that may have extra legroom. However, the proximity to the lavatory may be bothersome since passengers often congregate in this area during flight. Also, this seat is a bassinet location and passengers traveling with infants may often be seated in this area. The tray table is in the armrest, making the armrest immovable and slightly reducing seat width. There is no floor storage for this seat during takeoff and landing. 19 E None No Power Seat 19 E is a standard Economy Class seat. All D seats may have limited legroom and storage space underneath the seat due to the presence of an entertainment equipment box under the seat in front. 29 A None No Power Seat 29 A is an Economy Class seat that may have limited recline due to the bulkhead behind. The proximity to the galley and lavatory may be bothersome. All A seats may have limited legroom and storage space underneath the seat due to the presence of an entertainment equipment box under the seat in front. 29 B None No Power Seat 29 B is an Economy Class seat that may have limited recline due to the bulkhead behind. The proximity to the galley and lavatory may be bothersome. 29 C None No Power Seat 29 C is an Economy Class seat that may have limited recline due to the bulkhead behind. The proximity to the galley and lavatory may be bothersome. 29 D None No Power Seat 29 D is an Economy Class seat that may have limited recline due to the bulkhead behind. The proximity to the galley and lavatory may be bothersome. All D seats may have limited legroom and storage space underneath the seat due to the presence of an entertainment equipment box under the seat in front. 29 E None No Power Seat 29 E is an Economy Class seat that may have limited recline due to the bulkhead behind. The proximity to the galley and lavatory may be bothersome. 29 F None No Power Seat 29 F is an Economy Class seat that may have limited recline due to the bulkhead behind. The proximity to the galley and lavatory may be bothersome. 29 G None No Power Seat 29 G is an Economy Class seat that may have limited recline due to the bulkhead behind. The proximity to the galley and lavatory may be bothersome. 29 H None No Power Seat 29 H is an Economy Class seat that may have limited recline due to the bulkhead behind. The proximity to the galley and lavatory may be bothersome. 29 J None No Power Seat 29 J is an Economy Class seat that may have limited recline due to the bulkhead behind. The proximity to the galley and lavatory may be bothersome. 29 K None No Power Seat 29 K is an Economy Class seat that may have limited recline due to the bulkhead behind. The proximity to the galley and lavatory may be bothersome. All K seats may have limited legroom and storage space underneath the seat due to the presence of an entertainment equipment box under the seat in front. 30 G None No Power Seat 30 G is an Economy Class Bulkhead seat that may have restricted legroom. The proximity to the lavatories and galleys may be bothersome since passengers often congregate in this area during flight. Also, this seat is a bassinet location and passengers traveling with infants may be seated in this area. The tray table is in the armrest, making the armrest immovable and slightly reducing seat width. There is no floor storage for this seat during takeoff and landing. 40 E None No Power Seat 40 E is a standard Economy Class seat. All D seats may have limited legroom and storage space underneath the seat due to the presence of an entertainment equipment box under the seat in front. 41 E None No Power Seat 41 E is a standard Economy Class seat. All D seats may have limited legroom and storage space underneath the seat due to the presence of an entertainment equipment box under the seat in front. 42 E None No Power Seat 42 E is a standard Economy Class seat. All D seats may have limited legroom and storage space underneath the seat due to the presence of an entertainment equipment box under the seat in front. 43 A None No Power Seat 43 A is an Economy Class seat located in the last row of the plane and may have limited recline. The proximity to the lavatory and galley may be bothersome. All A seats may have limited legroom and storage space underneath the seat due to the presence of an entertainment equipment box under the seat in front. 43 B None No Power Seat 43 B is an Economy Class seat located in the last row of the plane and may have limited recline. The proximity to the lavatory and galley may be bothersome. 43 E None No Power Seat 43 E is an Economy Class seat located in the last row of the plane and may have limited recline. The proximity to the lavatory and galley may be bothersome. All D seats may have limited legroom and storage space underneath the seat due to the presence of an entertainment equipment box under the seat in front. 43 F None No Power Seat 43 F is an Economy Class seat located in the last row of the plane and may have limited recline. The proximity to the lavatory and galley may be bothersome. 43 G None No Power Seat 43 G is an Economy Class seat located in the last row of the plane and may have limited recline. The proximity to the lavatory and galley may be bothersome. 43 J None No Power Seat 43 J is an Economy Class seat located in the last row of the plane and may have limited recline. The proximity to the lavatory and galley may be bothersome. 43 K None No Power Seat 43 K is an Economy Class seat located in the last row of the plane and may have limited recline. The proximity to the lavatory and galley may be bothersome. All K seats may have limited legroom and storage space underneath the seat due to the presence of an entertainment equipment box under the seat in front. For this Version, Business Class is found from rows 1 to 7 and Economy Class begins at row 10, ending at row 43. This aircraft flies with 42 seats of Business Class and 316 seats of Economy Class. There is no storage space at all. And the risk that passengers passing the seat bumo into you because the aisle becomes narrow here. absolutely terrible this layout 3x43x. Too narrow and a mass of people. The plane when full is so heavy it drops out of the air when landing. Definitely NOT a 5 star service. 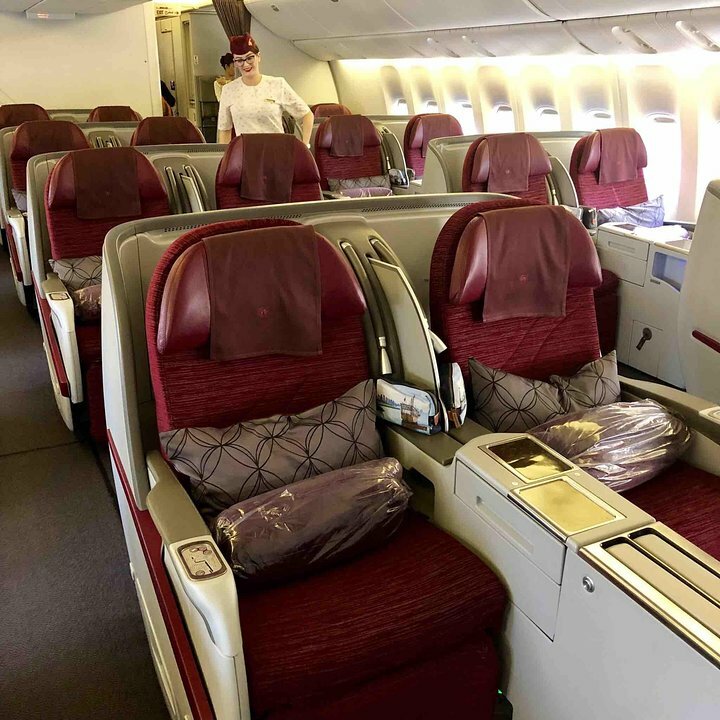 Qatar Airways new 10-abreast setup in Economy Class Boeing 777-300 is a total disaster. Someone has described it as crime against humanity, and after trying it out I can only agree. I was very determined when I asked the travel agent to book an aisle seat, but that didn't help much. The seats are hard and narrow, and you don't really know where to place your elbows. I am by no means a broad person, but I am Scandinavian, and we aren't as tiny as many people in Asia. From flying just 6 hours from Copenhagen to Doha I got severe back and neck pain from sitting in a wrong, forced position. I will never fly this aircraft and this configuration again. I have flown Thai Airways in a 9-abreast configuration, which was perfectly comfortable, and will be very aware of avoiding any 10-abreast configuration, except for the Airbus 380. On the return trip to Doha I sat in 11C one way and 19H the other way. The experience was similiar. On the positive side the seat has the same recline as other rows and as there is no one behind there is no need to bring you seat back up when meals are served. It's not the most comfortable seat I've travelled on and I'm glad it was only for a 7 hour flight. The benefits of this seat are the extra legroom however the seat is narrower, the armrest immoveable, there is nowhere to store belongings and no window. This Aircraft Type V1 should be declared as a crime against humanity. This is the finest example of How greedy an airline can get and how low they can stoop to just make a few extra dollars. They added 23 more seats (Yes, a measly 23) from type V3 so that they can cram in 316 economy passengers in V1 instead of 293 as in V3. While 23 looks like a small number, it completely destroys the sanity and health of all 316 economy passengers. They introduced a 4th seat in middle row. It cut every seat width by 2 inches to just 17 inches and making the aisles extremely narrow. Even the staff is so fed up working this lousy aircraft, it shows in their service. Reclining is almost non existant. Animals are transported better in their pens. Why there is no mass outrage or government intervention to prevent this literally a crime against humanity is beyond me. Shame on Qatar or any other airline that employs this torturous configuration. Avoid this airplane! Very narrow seats, arm rests and aisles. A horrible way to spend 14 hours. Give us back the 3-3-3 seating!!! This is the seat to be, if you are in economy. It is 2 seat row, so you have quite a lot of space for your legs. The last row in Business Class gets lots of noise from the bassinets - not just the two seats directly in front them. One poor baby (and parents) in row 8 cried the entire way from Dallas to Doha. It was the smallest seat I had to endure for the duration of what felt like a 15+ hour flight from doha to dfw. It was cramped, lacked legroom or storage of any kind. The plane was crowded, the service was terrible and overall would not recommend this route, this seat or this carrier to anyone. Flew QA Doha to Perth & return. 11 hour flight, comfortable, well served by QA staff and overall two flights that were as enjoyable as they could be in economy. The food is served from the back of the economy plane section moving forwards. They stop serving at row 36 (the seat behind mine) and then begin serving from the front of that section moving backwards. That means that I was always last to be served and I was always left with the food choices that nobody wanted, as all the most popular items had been picked. The problem is that they always serve in that order, so it was pretty unfair. I would suggest you ask for a particular dish before you board, as they will look after you a bit more. Also, the control was stuck in the socket and the screen's touchscreen technology was abismal, so I had to use the control on it's side. All in all, it was a pretty bad seat choice. This seat is between windows. There is a bulkhead right against your shoulder. Really uncomfortable & impossible to sleep. QR 1302 CAI - DOH Squanky refurbished new seats. Old controls and entertainment system. USB not functioning, thankfully charger below system availability. Great seat for additional legroom and knee-room since there is no seat in front of it. However, the lack of floor storage and the transition from the seats in front mean that service carts and passengers often bump into your legs. Qatar's flight attendants were excellent and courteous but the airline did not honor a special meal request. The seat reclines only half way, the flight was light so was able to manage. It is a normal seat width but there is a huge entertainment box at the bottom cramping leg space. These seats do not allow for the arm rests to go up... no good if your travelling with children and they want to sleep. Qatar's own w/s seat layout was incorrect, whereas Seat Guru's was correct. I assumed Qatar would be right & therefore got the wrong seat on the row where the seat in front was meant to be a gap. It wasn't, and to boot my legs were crushed by the seat in front. I am 1.86m. I had to put 1 leg in the aisle. It got trashed & bashed by everyone & everything. No sleep was possible. 2 flights on 2 versions of this Qatar 777 & even with all the pre-planning, I am struggling to find a fully comfortable seat. (Ditto the 9 wide Dreamliner, but those seats are just uncomfortable!) With V1/V2, either seat width or seat pitch are problematic. Seems 777-V3 layout may be the answer, as it is a 9 seat config. but all the versions claim a seat width of 17. Those aisles must be mighty wide on the V3! My faith is dented in the accuracy of some of these measurements , configs & layouts. Great food & service, otherwise. It was very difficult when you are traveling alone and you have window seat as you are ignored most of the times by crew members also and difficult to come out for rest room or for a walk. My seat number was 39K, it was a window seat. However, all window seats have an entertainment box. I still had legroom space, the box isn't too wide. Oryx One is updated a lot. Overall a very nice seat. Flew Perth to Doha late Nov 15 and back early Jan 16. 1st time in Business as I took wife to Europe for a white Christmas. This was 1 of those bucket list trips. Great flight, service was very good. Only issue was the seats where so long that the TV screen was over 1.5m away. Long way for my old eyes. Otherwise very good. Flew Perth to Miami Business Class, The service was wonderful, awesome aircraft 777-300er. The service onboard was very good, we was well looked after, great food, drinks and on demand dining. If I had a comment, it would be the 7 hour lay over in Doha, the airport is freezing, so have some warm clothing, I didn't! I flew between Chicago and Bengaluru, India round trip in the business class on 12/19/2015. I had the middle seat in the second row.This seat was very comfortable to sit and to sleep. The service was excellent. I am looking forward to take another trip soon. I would recommend Qatar Airways Business. I even joined the frequent flyer's club. My comments are a bit late, but since I am travelling on the same flight that I took in 2013 thought it was relevant. My seat was 3J Business Class and was very good. Service was excellent could not fault it that is why I am now flying Qatar again with my partner Perth to London 2016 will review again after we have taken the flight in March. 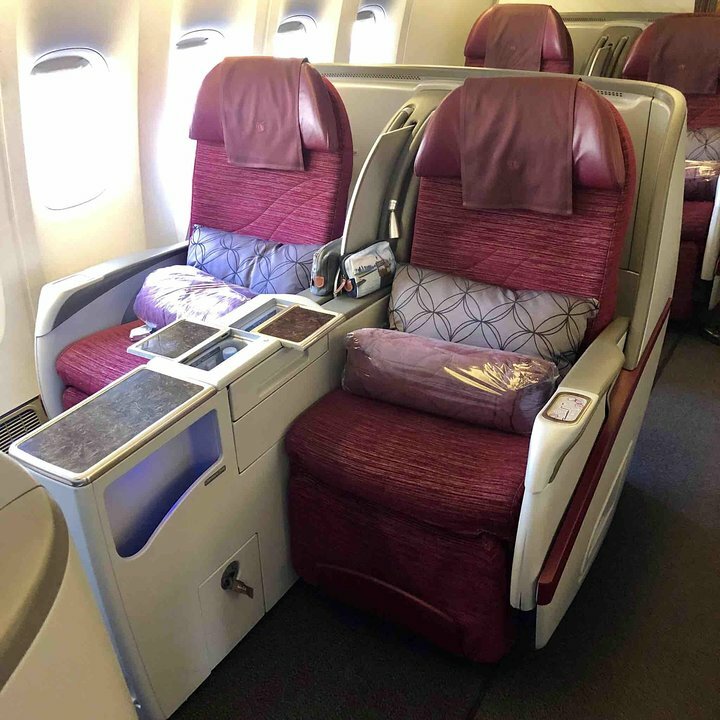 My wife and I travelled from Perth to Doha in Business Class seats 4A/4B. Contrary to what I had previously read, we found these seats to be OK - there is no window close to the seat but there is one in your space. Besides, on a night flight, we are not looking out. We found it quite comfortable being at the rear of the cabin and quite private. We have elected to have the same seats on our return to Perth. I flew with Qatar airways in this aircraft last year and was very happy with the service. I'm doing the same itinerary this year, I chose the same flights and got the same seats. I like those seats, the 2 seat row behind the main 3 seat section, no problems with bumping others mentionned. Great food, (except only one of the low lactose meals came to me with milk, cheese and cream) great service, and great staff. For seats in A, D, K it is impossible to get both feet under the seat if you have shoe sizes 10+ for a man. I have a size 12 shoe and could place my feet under the seat but unable to move them more than an inch or so because the media box consumes about 5" and then the isle bar is recessed, losing another 2". Effectively Row D is the WORST seat on the plane. I stood for an hour working with the staff to find me a different seat. I asked to get off the plane but they closed the door already and the plane was oversold so there wasn't a single free seat. Seats / service good as always ( have flown LHR-Perth & other Oz destinations several times) but special diet (Gluten Free) was v poor. Chicken offered 4 times LHR-PER and was dry and uninteresting. Chefs presumably don't know, don't care or can't be bothered about special dietary requirements. Delicious GF meals are v simple to make! The new Boeing with plenty of room and a great screen for viewing movies. Good seat position, not too near the toilets but close enough to get good service at meal times. 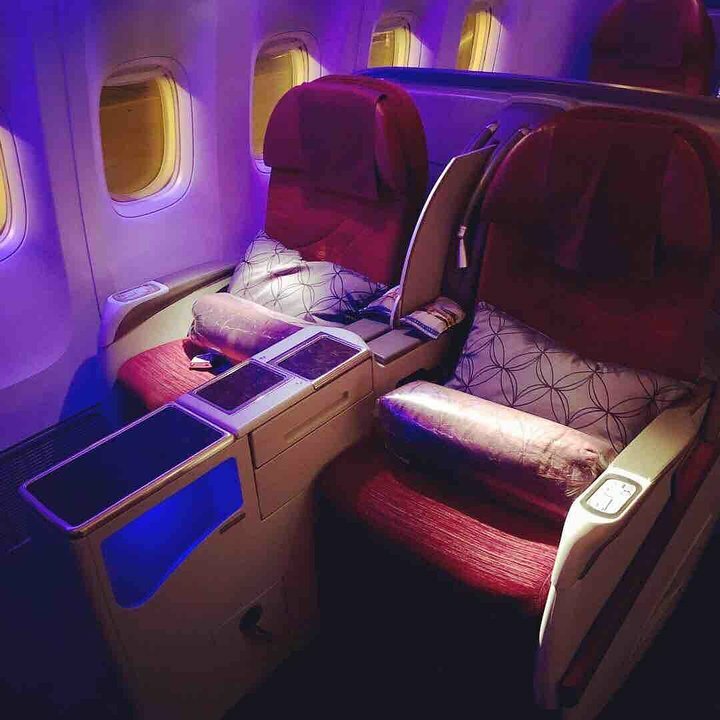 Great airline flew from Doha-Perth, most comfortable economy class, as well as great food and IFE, I would highly recommend this airline, youll have a 7 hour layover but its worth it to be comfortable on board. I took the DOH to IAD flight on 12/30/13. 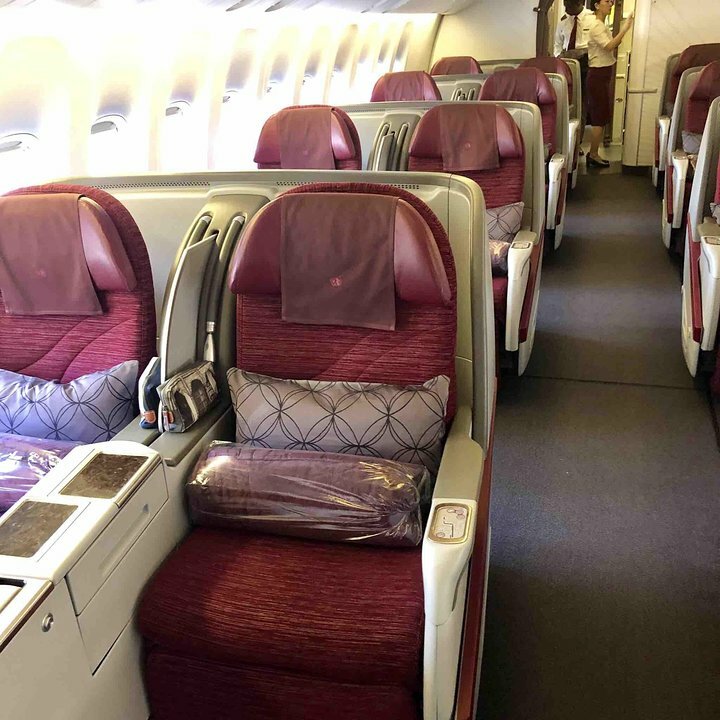 Qatar business class especially on the long-haul flights do not disappoint when compared to other middle east airlines. European counter parts struggle to match. Upon entering, the attendant will take you to your seat and take your coat immediately. Your personal attendant for the flight will introduce themeselves and will provide drinks and snacks prior to take off. The seat itself is very wide-you can comfortably sleep on your side or turn around while sleeping. The seat stretches out in different positions and is very comfortable in the full lie-flat position. You get the standard personal hygiene kit with blanket, noise-cancelling headphones, ear plugs, pajamas, and slippers. Toothbrush and shaving razors are in the bathrooms now. The customer service was above and beyond as they try to know your name, how many times you have traveled with them before (they had record of that), and they constantly come to you to see if you need anything to eat. My 14 hr flight flew by fast-was well rested and fed.